he Kilspindie Golf Club was originally founded as Luffness Golf Club in 1867. The members moved to new ground in November 1898 and the following year they reverted to the old name Kilspindie which was taken from the ecclesiastical ruin on the glebe. The course known as Wanster was accessed from the game-keepers cottage at Greencraig where the first tee (present 9th) was located. 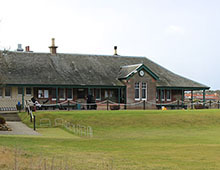 A rifle-range occupied part of the golf course which inevitably caused problems and the membership of the original Kilspindie Golf Club declined and was eventually disbanded. 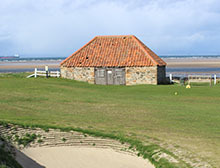 Near the entrance to Kilspindie Golf Club is the old Customs House dating from the 17th century. When the tide is out you can see the remans not only of sea going ships but also of war time submarines used as target practice by the Royal Air Force. It is had to imagine the present Aberlady Bay now silted up that ships with cargoes of fish, wine, potatoes, grain and timber were shipped out from the medieval harbour which was commissioned in 1535 and in 1633 an act of Parliament declared the harbour as the port oh Haddington. Over the years the bay was silted up and gradually Leith took over as the main port. One of the earliest references to golf at Aberlady states that following a big meeting at North Berwick, the Musselburgh caddies on their way back home would sell the old feather balls to the Aberlady village golfers. The price was dependant on the condition the gentlemen had left them when the day's play was done, normally a shilling a ball. The original Kilspindie members who took to playing their golf at Gullane began to play on the ground opposite Luffness House and in October 1867 they founded Luffness Golf Club. The golf course was laid out north of the Peffer Burn with access over the timber bridge (now leading to Aberlady Nature Reserve) and the adjacent ford used by horse drawn carriages. The holes were given names such as Short Hole, Quarry Hole, Bunker Hole, Long Hole, Home Hole. In the Golf Book of East Lothian, John Kerr writes that no minutes of this club have survived and the commencement dates are therefore unknown. For many years the club captain was 'old Jimmy Mackay', a road surveyor residing in Shore House, Aberlady. The oldest club to play over Gullane Links is Dirleton Castle Golf Club, founded in 1854. 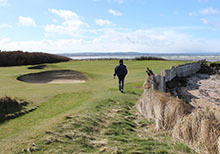 Luffness Golf Club continued to experienced problems renegotiating the lease from the landowner Henry W. Hope who sought more control over the increased numbers of golfers using the links. John Congalton (Shoemaker and Inspector of the Poor ) was appointed Club Secretary and Treasurer. The other members included Francis C. Burnet (Farmer at Craigielaw), Peter B. Swinton (Factor, Yester Estate), Thomas Lamb (Glasgow), Francis Mitchell (Aberlady Postmaster), and William Barclay (Painter & Die Sinker). Among the younger golfers was Robert Tait the proprietor of the old Aberlady Inn, the name of which he altered to the Golf Inn. His father John Tait ran the hostelry for over sixty years where the Kilspindie committee held their meetings. In August 1905 James Braid and Harry Vardon were the quests of Mr. Purssell owner of the Golf Hotel, Aberlady. Mr. G. Riddell proprietor of the ‘News Of The World’ who was staying at Bisset’s Hotel, Gullane was instrumental in arranging a series of exhibition games.The four-ball foursomes were played on Gullane old and new courses, New Luffness, Archerfield and Kilspindie. James Braid and his partner George Riddell played against Harry Vardon and John B.Stevenson Kirklands, Gullane. The first club competition was played in 1867 for the President's Medal which was later renamed the H.W.Hope Medal. The inaugural winner was Peter Hunter, a 19 year-old baker to trade with a shop on the Main Street in Aberlady. In 1868 Club Captain George Hope presented the Hope Challenge Medal for a stroke play competition open to golfers from all clubs in East Lothian. The first winner was John R. Whitecross representing Tantallon Golf Club. In 1901 the winner was Fred McLeod representing Bass Rock Golf Club. He joined the professional ranks and emigrated to America wining the US Open Championship in 1908. But Luffness Links are best o' a"
In 1893 H.W.Hope with the advice of old Tom Morris laid out the course we know today although the greater part was not on Mr. Hope's property but on Gullane Common. A group of Luffness members broke away from the original club in 1894, forming the Luffness New Golf Club playing over the new links. In 1897 the club approached Lord Wemyss with a view to acquiring Craigielaw Links for golfing purposes. These negotiations were more successful and local professional Ben Sayers and Luffness member Alex Mackenzie Ross submitted their recommendations for a 9-hole course with the proviso that if the ground at the Butts and the Target were to be included, then it would make a full 18 hole course that would equal almost anything in the Kingdom. Sayers concluded with his familiar sales pitch to the committee. " One would almost think nature had intended this for 18 holes as there is just sufficient ground and no more." The course was opened in November 1898 and the following year Luffness Golf Club adopted the old name Kilspindie Golf Club. The Wemyss County Cup was donated by the Earl of Wemyss in 1868 for competition among the golfers of East Lothian and the tournament was organised by Luffness Golf Club and later Kilspindie Golf Club. The format for the Wemyss County Cup was a straight draw, hole and hole knock-out over the double foursomes decides the winner. The Wemyss or East Lothian Country Cup is the oldest foursome tournament in the world. Kilspindie was among a number of Clubs who contributed to the purchase of the Amateur Championship trophy. The first professional to be attached to Kilspindie Golf Club was John Nairn in 1903. He was originally from Perthsire before being appointed green-keeper at Gullane Golf Club. 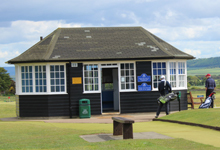 He resided in the head green-keepers cottage St John's next to Gullane Clubhouse. Nairn was persuaded to join Kilspindie Golf Club and was able to offer golf lessons, caddying and was available to partner the members. In 1905 John Nairn was appointed head green-keeper at North Devon Golf Club (Westward Ho!) and was followed at Kilspindie by Tom Currie (1906). Willie Forrester a local gardener was listed as green-keeper and professional in 1910-11. George Dalziel a solicitor in Edinburgh was Captain of Tantallon Golf Club (1894-96) and was also a member of Luffness Golf Club. He successfully negotiated the terms of the lease with Lord Wemyss and was rewarded by being elected the first Captain of Kilspindie Golf Club. Dalziel resided in Redholme in North Berwick and was also involved with the negotiations of the lease between Sir Walter Hamilton-Dalrymple and the North Berwick Town Council and again in appreciation of his efforts he was elected Captain of North Berwick Burgh Golf Club in 1906. One of the most outstanding members of the old Luffness Golf Club was Tom Harley who emigrated to Canada and won the first Canadian Amateur Championship in 1895. Thomas Harley was born at Limekilns, Fife in April 1855 and moved with his parents to Aberlady, where he served an apprenticeship as a joiner and worked with Peter Brown, who was a founder member and captain of Luffness Golf Club. Tom Harley won the Hope Challenge Medal in 1875, 1877, 1879, 1880 and remains the only player to have won the Medal four times. Harley was a popular playing partner of the Earl of Wemyss, the Earl of Warwick, Lord Elcho, Rev. Mr. Tait, and Lord Moncreiff. In 1880, Harley moved to Edinburgh before emigrating to Canada where he was employed as a carpenter and stevedore (charge-hand) in the dockyards of the Royal Military College in Kingston, Ontario. In 1895 he entered the Canadian Amateur Championship from Kingston Golf Club and defeated Alex Simpson (Royal Ottawa Golf Club) in the final to become the first Amateur Champion of Canada. He received a Gold Medal and the Aberdeen Cup donated by Lord Aberdeen to the Canadian Golf Association formed the previous year. Tom Harley went on to represent his club in a number of interprovincial matches between Quebec and Ontario. Kingston Golf Club situated in the city of Kingston 200 km. east of Toronto on Lake Ontario, went out of existence in 1925. In 1898, Tom Harley was persuade by Henry J Hewat to move to America and become the first golf pro at North Jersey Golf Club. Henry J Hewat was born in Castle Douglas and emigrated to America in 1895. He was vice president of Samuel Smith & Co, a railroad locomotive manufacturer in Paterson, New Jersey. Hewat was the first president and captain of Paterson Golf Club. He also assisted in laying out the course in Tuxedo Park, New Jersey and was a member of several golf clubs including Kingston and Montreal in Canada. In 1935 Hewat returned to Castle Douglas and donated the present clock tower to the town. Harley played in a pro tournament at Ocean County Hunt and Country Club, Lakewood, NY on New Years Day 1898. According to the New York Times the field also included North Berwick pros, Harry Gullane, Robert Thomson, Willie Anderson, James Campbell and Harry Reddie. The Fitzjohn brothers whose father was clubmaster at Muirfield played-off for the first prize. By 1909 Tom Harley was a golf teacher at North Jersey Golf Club and he resided on Van Houten Street in Paterson City. Following WW1 Tom returned to his trade as a carpenter and was employed at Barbour Flax Spinning Works on Grand Street, Paterson, NJ. Harley visited Aberlady in 1911 and during his vacation he played in a competition for Kilspindie Golf Club and won the Edward S. Hope Challenge Cup. The trophy was presented to him by the club captain Rt. Hon. A. J. Balfour, former British Prime Minister (1902-05). When Harley returned to Aberlady permanently in the 1920s he worked with John Cuthbert who had a carpenter and undertaker's business in Back Lane, Aberlady. Harley was proffered Honorary Life Member of Kilspindie Golf Club in 1928. He resided with John Cuthbert at 'Maryville' in the High Street (now Rushmoon House) where he died in 1943, aged 88 years. His achievements are recognized in the Canadian Golf Hall of Fame and Museum in Oakville, Ontario. John Reid Nairn born 1872, at Logierait, Perthshire son of William Nairn a domestic gardener and his wife Jessie Reid. On leaving school John Nairn worked as a gardener at Pitnacree House, Strathtay before being appointed green-keeper at Gullane Golf Club in 1900. He resided in the head green-keepers cottage, St John's next to Gullane Golf Club. In 1905 he moved to North Devon Golf Club and in 1923 he joined Allan Gow from North Berwick as pro at Tyrrells Wood, Epsom, Surrey. John Nairn died in June 1944 in Surrey. George Adam Shepherd, born 20 November 1857 in Gullane, East Lothian son of James Shepherd an agricultural labourer and his wife Christina Goodall. George and his brothers William (b.1847) and John (b.1860) were farm labourers working on Saltcoats Farm and Luffness Mains while they resided with their parents in Golf Cottage, Main Street, Gullane. In 1864 their father James Shepherd held the lease on the rabbit warren on Gullane Hill, and his brother George Shepherd organised the horse training on the common land owned by Mr. Nisbet. In September 1882 George Shepherd was hired as the first green-keeper at Gullane Golf Club and for a while he maintained both courses at Gullane and Luffness. In 1888 George Shepherd was appointed green-keeper at the old Luffness course and in 1893 he staked out the Luffness New course designed by Old Tom Morris. In 1896 George and his mother resided on the Main Street, Aberlady while his brother John Shepherd also a green-keeper resided with his wife Beatrice in the Wynd, Aberlady. George and his brother John were members of the artisan Dirleton Castle Golf Club playing over Gullane Hill and in 1886 they where in the wining Wemyss County Cup team. George Shepherd's name is also inscribed five times on the Dirleton Castle's Patron's Medal. In October 1894 George Shepherd played in the competition to mark the opening of Luffness New course. Ben Sayers carded rounds of 84 and 82, for the wining total of 166 and £25 prize money. Davie Grant was second on 170 and Willie Auchterlonie, the Open Champion, tied with Andrew Kirkaldy for third place on 175. Old Tom Morris at the age of 73 years took part, playing over the course he laid out the previous year. The landowner Mr. H.W. Hope provided lunch for the competitors and a refreshment tent where the pros enjoyed a whisky or three. Sayers abstained from alcohol all his life. Hundreds of spectators travelled from North Berwick to watch the tournament in dog-carts and carriages of every description which were parked on the grass verge on the road between Gullane and Aberlady. The assistant green-keeper at Luffness New Golf Club was Charlie Henderson from Bervie in Kincardine who replaced Old Tom Morris as superintendent at St Andrews with a salary of 35 shillings a week. Henderson started his duties on the St Andrews links in October 1900 but following a disagreement with his green-keeping staff, he was replaced in March 1902. George Shepherd remained single and died in 1912 in Gullane, East Lothian. Thomas Pilling Waggott was a golf club-maker in Aberlady and Musselburgh at the end of Queen Victoria's long reign. In the early years, William Waggott and his son Thomas P. Waggott worked in a variety of Tannery's in Dundee, Edinburgh, Inveresk, Arbroath and Port Glasgow where Thomas was born in 1859. William Waggott also made golf clubs and had several patents to his name. Willie and Tom Waggott gained a reputation for making wooden-shafted clubs and gutta percha golf balls under Royal Warrant in Aberlady. The heads were purchased from Tom Stewart of St Andrews and Gibson of Kinghorn. In 1893 they opened a shop at 49 Comiston Road under the name Thomas P. Waggott while their family resided at 7 Balcarres Street, Edinburgh. Tom Waggott's wife Annie Howden came from Dirleton and in 1890 they resided at 4 Golf Place, Musselburgh. In 1894, Tom Waggott played the best ball of two Musselburgh members and teed off the face of his watch for every drive. He was round in bogey and never scratched the watch. Tom had a shop in The Wynd, Aberlady (opposite the village hall) trading under W. Waggott where they sold golf clubs and his eighty-year-old father William and sister Mary opened a restaurant between 1893 and 1915. Tom Waggott and his family resided in Sunset View in Aberlady and continued in business until his death in July 1941. In 2017 Kilspindie Golf Club celibrated its 150th anniversary. The club was originally formed as Luffness Golf Club in 1867, the 35th registered golf club in the world. Bridge over the Peffer Burn and gound where the Old Luffness Golf course was laid out. From Edinburgh take the A720 City By Pass (South) - follow sign post Berwick-Upon-Tweed (A1). Continue on A1 (South) take the A198 - sign post North Berwick. Pass through the villages of Longniddry, Aberlady to Gullane. Drive time from Queensferry Crossing and Edinburgh Airport 45 minutes. From the A1 motorway take the A198 - sign post North Berwick. 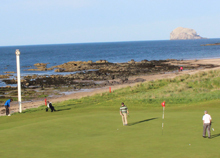 Continue through North Berwick on the A198 - sign post Edinburgh for 7 miles to Aberlady.